We are a leading Manufacturer of corrugated bundler strapping machine, automatic squaring machine and corrugated 3- sided bundle squaring and strapping system from New Delhi, India. 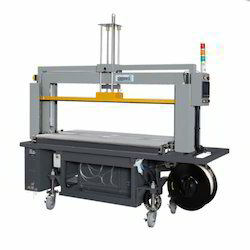 Description Jia-In Industry Co., Ltd. is one of the leading manufacturers of Strapping Machine and Wrapping Machine. Our main products include Corrugated Bundler, Pallet Wrapping Machine, Carton Sealing Machine and Strapping Tools. Description The squaring machine has been designed to square a stack of articles with its end and side surfaces perfectly with its top and bottom surface, in order to improve the stack quality of the bundles. 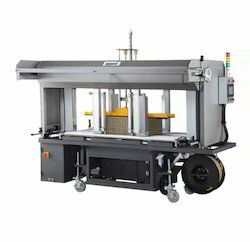 Integrated with the existed horizontal conveyor system for transporting a stack of articles into the squaring zone, and also outfeeding to palletizing system, the squaring machine handles the bundles squared-up to alignment of surfaces. Description The Matrix 88CS is built with Matrix 88C corrugated strapper combined with the 3-sided squaring station. Integrating with square machine with higher strapping speed, less maintenance and wide productivity with the cost-effective solution, Matrix 88CS is designed specifically to the corrugated industry. The electrically backstop and side squaring assure the optimized accessibility and service-friendliness, also provide bundle squaring capability. 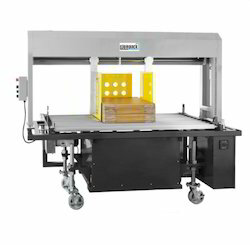 With the integration of in-line strapping and squaring system, the Matrix 88CS can offer the precise bundle control, neater and more stable pallet loads. Looking for Corrugation Strapping Machine ?